China State Construction Engineering Corp has signed an agreement for the purchase and redevelopment of the Nassau British Colonial Hilton Hotel and adjacent property. The deal was signed during an official ceremony held in the foyer of the hotel October 24. Prime Minister Perry Christie was in attendance for the occasion. He said that the event signified an objective that the government has been pursuing for several years. “My government’s objective has been not only to secure a qualified buyer to upgrade and operate the Hilton Hotel, but one with the means to proceed forthwith to develop the vacant property to its fullest potential for the greatest economic benefit to both the investors and the local economy,” he said. Christie said that the sale of the hotel would be beneficial to the country, resulting in the employment of 250 construction jobs and 500 permanent jobs. In addition, he projected that approximately 500 jobs will be created in the amenities and commercial components of the project. 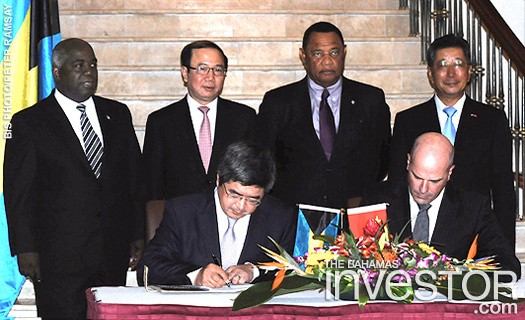 China State Construction and Engineering chairman Yi Jun thanked the government for assisting with the acquisition of the hotel and said that he was optimistic that his company would be making a major contribution to the Bahamian economy. Also delivering remarks was Chinese ambassador to The Bahamas Yuan Guisen, who congratulated the Bahamian government for its participation in the sale of the hotel. The new buyers plan to create a luxury hotel and condominium units on the hotel sites. In addition, the plans include the construction of a multi-storied garage building with roof top garden and banquet rooms, high-end retail shopping, restaurants, gymnasium, movie theatre, nightclub, marina and boardwalk along the entire waterfront. The developer has also indicated its willingness to join in a public/private sector agreement with the government and other stakeholders along Bay Street to implement an overall plan for redevelopment extending from Arawak Cay in the west to Potters Cay in the east. Prime Minister Christie said that the government would discuss those plans with stakeholders over the next fortnight. He said that some of these stakeholders are ready to proceed with their redevelopment plans. To this end, they have retained the services of Todd Hill of DTJ Design Master Planners along with local architect, Michael Foster, who worked on the original EDAW City of Nassau Redevelopment Master Plans. The China State Construction Engineering is also the builder of the $3.5 billion Baha Mar mega resort.